The question most fast food scholars ask is why name the chain “Red Barn” and not Red Caboose or Red Dwarf? Well, Red Barn was named for a valid reason and the buildings they occupied were built to look like barns for that very same reason. This was a pioneering food chain. They believed in utilizing only 100% organic, locally-produced ingredients, refusing to even countenance the boxes of mass market deep-frozen staples that were being trucked into their competitor’s loading docks from God knows where by Sysco Food Systems, Inc. and their ilk. This chain was a breed apart and the blue-ribbon breed always gets to live in the big Red Barn. Every farmer knows this. But pioneers also have it rough and Red Barn was bit too far ahead of their time. Their cheapest basic meal started at $11.99 (remember this was 30+ years ago) and that was before adding a small 7.5 ounce bottle of the purest mineral water to wash it down with. People loved the food, but in the end it proved to be too dear for them. They had mortgages to pay and college tuition to save up for. It is a cult of fond remembrance today. 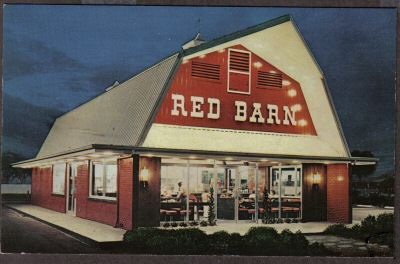 At its peak Red Barn had 400 or so restaurants in 19 states and every single one had its own unique sourcing in place to fulfill the basic menu of hamburgers, chicken and fish. We actually had a Red Barn in the tiny faux-Colonial village in which I was raised and it featured delectables no sane gourmand could refuse. Fish sandwiches crafted from the succulent inland freshwater cod hauled in daily from the sparkling Mahoning River, fried chicken delivered straight from the world-famous poultry farms of nearby Farrell, Pennsylvania, where birds would routinely grow to be the size of Verne Troyer, and of course the belly-busting 1/2 pound hamburger patties fashioned from exquisitely marbled beef that came straight from the cattle ranches of Campbell, Ohio, where the bovines were fattened up on a steady diet of the richest Greek yogurt. Best of all were the mascots. Red Barn had no interest in nonsensical made-up names like Grimace or complex portmanteaus like Hamburgler. They kept it simple. Hamburger Hungry, Fried Chicken Hungry and Big Fish Hungry. They had a great song that they sang and “live” versions of these delightful characters were required to be on-site at every Red Barn during operating hours. The kids loved it. If only their parents had been willing to sacrifice just a tiny bit more, all of us might still be enjoying this unique dining experience even today.